"You learnt a lot of customer skills and got used to being in a salon in a professional environment. It helps you when you get into the workplace because you’ve got that experience." Within a week of starting his course he said students were “thrown in at the deep end” and asked to bring in customers. 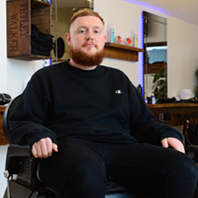 The 23-year-old, who now works at Knight and Co in Ilkeston, said he enjoyed barbering in his Year 10 work experience at school. But rather than immediately following that career, he said he was persuaded to go to college to do ‘A’ levels. He decided to drop out after a year – “I’d just had enough” – and went to Derby College instead to take his NVQ. Aaron added: “Downstairs there was a fully functioning salon where people would come in and pay. We had to come into college on a Saturday, just to get us used to doing that, and we’d go downstairs. We’d be training on our dolls’ heads, or washing each other’s hair, or practising on each other’s hair, while there were clients having their hair cut. Find out about studying Barbering at Derby College.